Housed in a historic railroad depot on the banks of the Mississippi River, the Louisiana Art & Science Museum offers educational entertainment for visitors of all ages. The art galleries showcase changing fine art exhibitions and selections from the permanent collection. In the interactive art and science galleries designed just for children, creative and enlightening fun comes in many forms. The Ancient Egypt Gallery houses ancient artifacts and a Ptolemaic-era mummy that rests in a re-created rock-cut tomb. The Irene W. Pennington Planetarium features sky shows, large-format films, visual music shows, and galleries devoted to space science. In the Museum Store at the Art & Science Museum, visitors enjoy shopping for unique handcrafted merchandise, books, toys, and a large selection of objects related to the museum's exhibits. 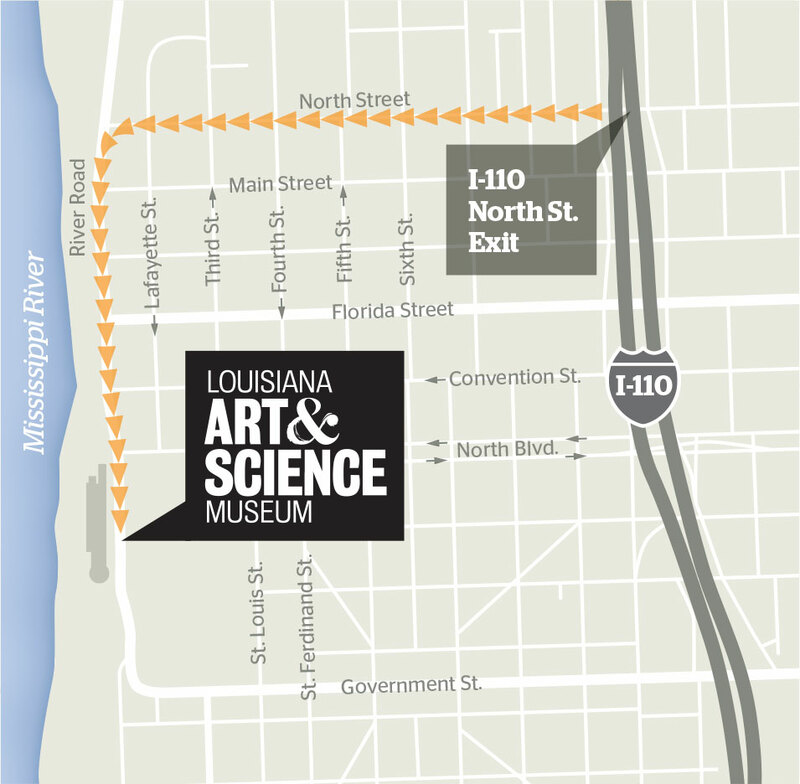 Louisiana Art & Science Museum serves the community through lectures, workshops, classes, teacher inservices, camps, and other programming. The Museum is accredited by the American Alliance of Museums and is a member of the Association of Science and Technology Centers. The Art & Science Museum receives generous operating support from the East Baton Rouge City Parish Government, and members of the Museum. Louisiana Art & Science Museum is also supported in part by a grant from the Louisiana Division of the Arts, Office of Cultural Development, Department of Culture, Recreation & Tourism, in cooperation with the Louisiana State Arts Council. Funding has also been provided by the National Endowment for the Arts, a Federal agency. The Museum is located at 100 River Road South in downtown Baton Rouge. The building is next to the Mississippi River and is west of, and across River Road from, the Old State Capitol. Metered parking may be available in front of the Museum on River Road. Additional street parking is available on North Boulevard, Convention Street and adjacent parking lots. For a complete parking guide for the downtown area, please visit the Baton Rouge Downtown Development District.